Another upgrade to my shallow fast water trotters. The Shouldered Irwell Sticks are wider for more turbulent water than the MKIIs, have a bigger body and have a large step in them to stop any movement of the rubbers. This pair have been finished in a favourite metallic blue paint that I like with a feather plus red, gold, blue and black threads. This float really is my cup if tea and I am gagging to use a few !!!!!! I can see me making a few of these for the coming season not to mention the Bridgenorth trip with my dad.
" Casterman " AKA " Derek Kenyon " requested a favour just after Christmas for a pair of floats. He required a cross between a standard avon style and a bolognese float. I had a play around with some bits of left over balsa and came up with the pair below. A little late for the end if the season as promised but at least you both have something to look forward to come June 16th. The pair above were constructed from balsa, cane and aluminium, threads used were black & grey. The paint is a new red metallic, pearlescent I have recently taken a fancy to and will be used on a few other floats I have in the pipe line at the moment. 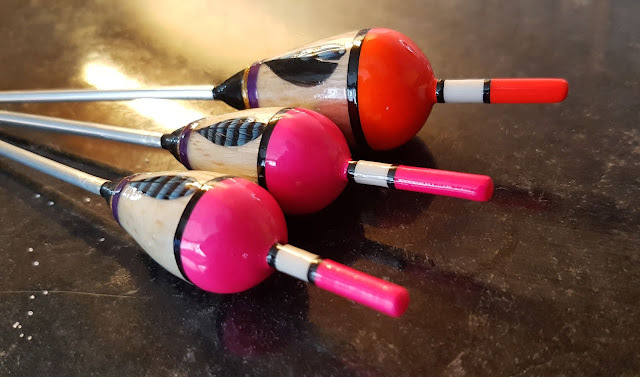 There will be a bit of a wait for my pals to get these wet so I will remind them both nearer the time to get me some nice fish an float pictures for the blog. I used to love float fishing on the River Severn in Bridgenorth for barbel with my dad in the early 1980's and was lucky enough to be the first name on our school match trophy all those years ago. This year we and a few friends are planning a trip down memory lane revisiting the stretches of the mighty River Severn where I learnt to fish a float on a river over 30 years ago. 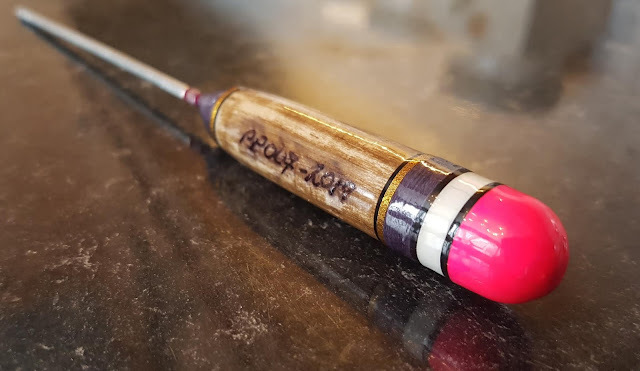 😲😲😲😲😲 To commemorate the trip I am making a few new stick floats, hopefully, to catch a few barbel, amongst other species and get some nice pictures for the blog (Not to mention a bit of banta and a few pints ) 😉 This is the first one. A barbel stick Taking approximately 4AAA ( Hopefully a little more ) Constructed in balsa and aluminium the body was turned from a single piece to increase strength for the rigours of heavy barbel fishing. 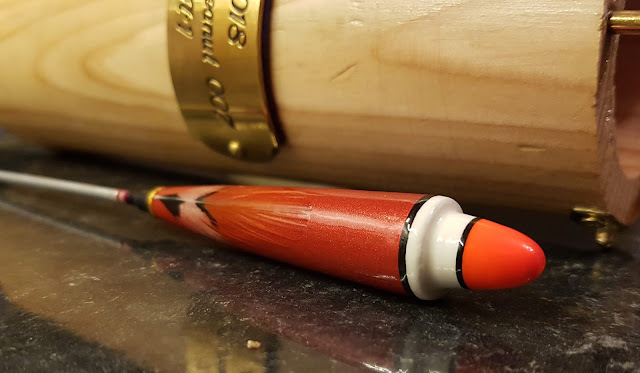 A fluorescent orange tip, red pearlescent body, Plus a feather inlay & Black gold, violet and scarlet silks completed the build. without falling in this time. 🤣🤣🤣🤣 Knowing the river a little better I was fishing within a minute and hooked into my first grayling within 5. She was a belting fish to nudging the 2lb mark at a guess. 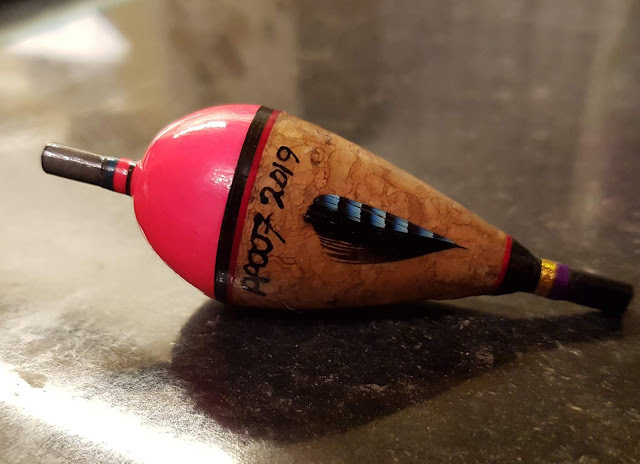 The second float made for Kayden McCarthy is a very small sliding pike float. Made from carbon and cork this float only takes 3.5 g and is designed to cause as little disturbance as possible when cast into the swim. ( I know because he told me. I am no piker ....lol ). It has is name on it and is finished in black, red, gold and violet whipping plus a small jay feather. big pike from the central Manchester canal systems. Both floats. Kaydan will be getting the pike float wet this weekend. Lets hope he can bag a croc for the blog. I have every confidence in the young man. Kayden has just sent me a picture. 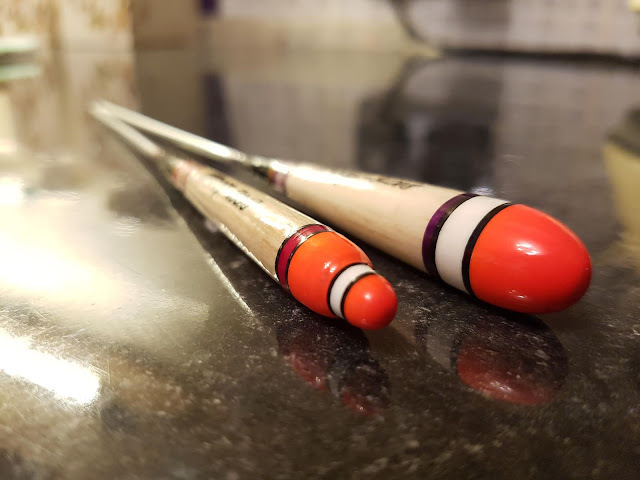 If you would like to look at my handcrafted click on the link below. I was minding my own business over Christmas playing with my floats when my phone buzzed. I flicked on messenger....... It was from young Kaydan McCarthy. I need it Jumbo size. 3AAA if possible " ? but I won't steal his thunder and tell you exactly where. I have also used a stainer on this float for the fist time and I am quite please with the results. Black, violet, metallic grey and gold where the threads used. Kayden McCarthys Jumbo Irwell Stick.